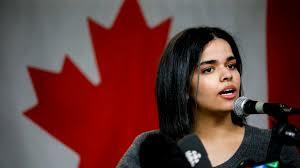 While on holiday in Kuwait with her family, Rahaf Mohammed al-Qunun fled to Thailand. She arrived in Thailand on January 5, 2019. Mohammed had originally planned on flying to Australia but decided instead to enter Thailand. Once in Bangkok, at the Suvarnabhumi Airport, Mohammed tweeted that she was seeking refugee status from any country that would protect her. Mohammed wanted protection for her choice to leave Islam and protection from her abusive family. Almost a week later, Mohammed who had been barricading herself in a hotel room, was granted asylum in Canada. Mohammed live tweeted the barricade and demanded to speak with representatives from the U.N High Commissioner for Refugees. Over the course of the week, the tweets gained approximately 10,000 followers and #SaveRahaf was being used by supporters. This case demonstrates the power that social media plays in bringing issues to the forefront. Mohammed explains that she fled her family in search of independence. She wants to be able to travel, seek an education, have a career and decide who she wants to marry. Although this is a highly visible case, there have been several Saudi women who have fled the country in an attempt to circumnavigate the restrictive laws governing women’s rights. After arriving in Toronto, Mohammed states that she feels ‘reborn’ as she entered the country. She is excited to try parts of life that have been previously denied to her. The National Society of Human Rights, a Saudi Arabian human rights organization, released a statement implying surprise that some countries were encouraging Saudi females to rebel against their parents. Although blow-back seems inevitable, Trudeau see the granting of Mohemmad’s refugee status as a step towards furthering Canada’s commitment to protecting women’s rights. Seeking asylum in Canada involves a very specific set of requirements to be met. Issues that might cause a person to be inadmissible through other streams of Canadian immigration will likely also be deemed inadmissible when seeking asylum. An example of this might be a past criminal offense. Additionally, the case will look to see if you have made a previous claim to immigrate to Canada or if you have received protection from another country. Asylum seekers are different than refugees and make a claim at a Port of Entry or at an in-land office. International treaties play a role in the evaluation of these cases.